Every year I get zucchinis and every year I only use zucchinis for two reasons: to roast or to make bread. 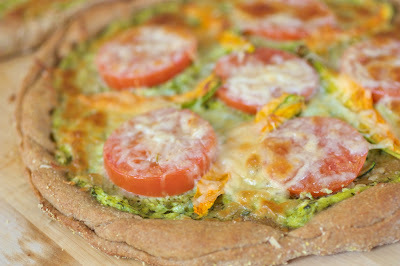 This year, I got bored with that idea and experimented with zucchini and pizza. I roasted (I know, still roasting) the zucchini until the pieces were soft enough to process. 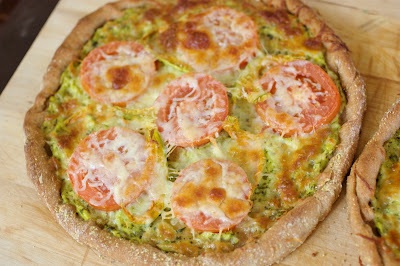 I then added in some yogurt, cheese, and herbs to pureed zucchini to make an awesome sauce for the pizza. On top of using zucchini in the sauce, I wanted to use the great flowers I got from the csa. 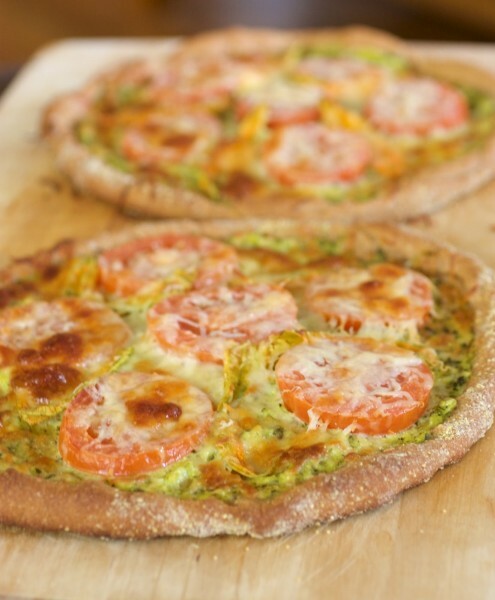 I threw those on top with some tomatoes and cheese to make one delicious pizza! I think I broke through my zucchini rut. In the bowl of a stand mixer, combine water, honey, and yeast. Stir and let sit until yeast becomes active and mixture looks foamy. Add in remaining ingredients, using only 3/4 cup of flour, and begin to mix with dough hook. As dough comes together, add as much extra flour as you need so that dough begins to pull away from the side of the bowl. Once dough has enough flour, let mixer run for 5-8 minutes longer in order to knead dough. Once done, spray with oil and set aside. Let rest for 45 minutes. Preheat oven to 425˚. Roughly dice zucchini and roast for 20-22 minutes until zucchini is slightly browned and soft. Place in a food processor and add remaining sauce ingredients. Pulse until sauce is creamy. Once dough has risen, roll out into one large circle or two smaller circles. Spread zucchini sauce onto crust, top with flowers and tomatoes, and top with remaining cheese. Bake for 15-20 minutes until cheese is browned and crust in crispy. I find myself in a zucchini rut come august when they are being sold everywhere for five cents a pound and I feel compelled to buy twenty pounds of them! This is a great way to use them up…I love that you turn the zucchini into a sauce. Mm, that sounds amazing. Zucchini is really good on pizza! I used to get them at the farmer’s market in San Francisco when I lived there, sooo good. well this is officially brilliant! I adore zucchini! Stupid question though…what are zucchini flowers? I figured a wikipedia reference might help better than me talking in circles: “The female flower is a golden blossom on the end of each emergent zucchini. The male flower grows directly on the stem of the zucchini plant in the leaf axils (where leaf petiole meets stem), on a long stalk, and is slightly smaller than the female. Both flowers are edible, and are often used to dress a meal or garnish the cooked fruit. You can find them at some farmer’s markets or if you grow zucchini, you can use those! Hope this helps! I love this blog! I love this blog! I LOVE this blog!!! You are amazing and I am dying for your book to come out!